The Citizen PPU-700II has been discontinued. No direct replacement is available. The PPU-700II thermal kiosk printer is the most modular and flexible kiosk printer for paper width, interfaces, firmware settings, and mechanism orientation. The PPU-700II works in a wide variety of kiosk applications to provide fast reliable printing with the easiest maintenance possible. 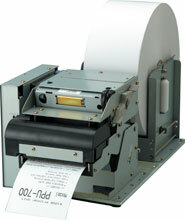 PPU-700II, Kiosk Receipt Printer, 58-83 mm Width, Thermal Printer Assembly with Retractor, Parallel Interface.